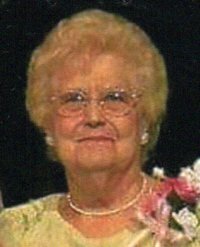 Dorothy F. May, 87, a resident of Christ the King Manor, Dubois, went to be with Jesus on Sunday, November 25, 2018. Born on March 17, 1931, she was the daughter of the late Peter H. and Nellie Pearl (Johnson) Hostoffer. Dorothy married Clyde H. May on June 2, 1950; he preceded her in death on June 23, 2009. Dorothy and Clyde pastored six different Christian and Missionary Alliance Churches, beginning their ministry by planting a church in Cochranton, PA in 1954. Always in Western, PA, they eventually retired to what became the hometown of their hearts, Spartansburg, PA.
She was a faithful helpmate to her husband in ministry as a Sunday School teacher and pianist, among many other duties over the years. In later years, after settling in Spartansburg, she worked as a caregiver for two ladies in their declining years, and thoroughly enjoyed it. She also very much enjoyed entertaining visiting ministers, missionaries, and music groups in her home; and she loved setting a table, as she was a very good cook and hostess. Dorothy is survived by two sons, Clyde A. May and his wife, Barbara, of Brockway and Ronald K. May and his wife, Kathy, of Unionville; two sisters, Nancy Lowers and her husband, Ray, of Naples, FL and Martha Starenchak and her husband, Bob, of Youngwood, PA; seven grandchildren; 15 great-grandchildren; and several nieces and nephews. In addition to her parents and husband, she was preceded in death by a brother, Peter and a sister, Alice; who both passed away as infants. There will be no visitation, but there will be a celebration of life for Dorothy on Saturday, December 15, 2018 at 11 AM at the Spartansburg CM Alliance Church. The family suggests that memorial donations be made to Brookside Senior Living and Christ the King Manor. Arrangements have been entrusted to Furlong Funeral Home, corner of Broad St. and First Ave., Summerville, PA.